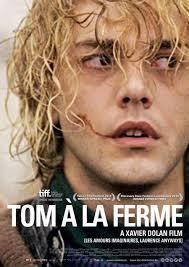 Controversial, award-winning Canadian director Xavier Dolan presents this Hitchcockian suspense drama. Dolan stars as the eponymous protagonist, a hipster who leaves the city to attend the funeral of his partner, who hadn’t yet come out as gay to his family. Beleaguered by his partner’s despondent mother and bestial brother Francis, Tom is soon trapped in a twisted game. Francis is such a threatening figure that Tom’s intended drive back to the city quickly assumes the urgency of a daring escape. But a logistical hiccup compels Tom to turn around and head back to the farm. Increasingly turned on by the vicious Francis, Tom ends up carrying out rustic chores and withstanding physical abuse. The scenario is further complicated by the farm’s obscure past that ominously bodes greater darkness ahead. Simultaneously creepy and compelling, this 2013 VENICE FILM FESTIVAL WINNER boasts of gorgeous cinematography and a striking musical score. A little late at night, but very worthwhile!